A beautiful metallic organza drawstring party bag containing a pretty jewelled headband tiara, a magical wand, Disney princess temporary body tattoo and bubbly micro-touch-a-bubbles. A beautiful metallic organza drawstring party bag containing a jewelled tiara & matching wand, a Disney princess notebook, pencil and rubber, a pretty hair accessory and pretty temporary body tattoo. A beautiful metallic organza drawstring party bag containing a pretty flower lei, a Fluffy Flamingo Pen, a Hibiscus flower temporary body tattoo & packet of magical catch a bubbles! A beautiful metallic organza drawstring party bag containing a bautiful jewelled tiara, magical wand, bubbly micro touch-a-bubbles and Frozen character sticker sheet. 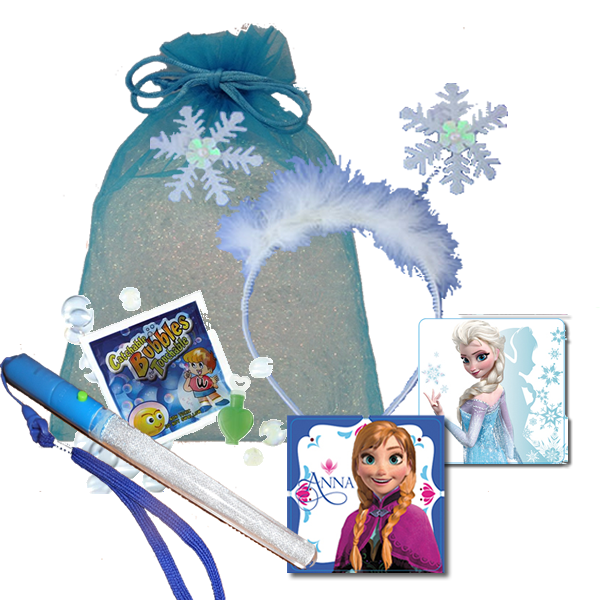 A beautiful metallic organza drawstring party bag containing a snowflake headband, flashing magical wand, bubbly micro touch-a-bubbles and Frozen character sticker sheet. A beautiful metallic organza drawstring party bag containing a magical jewelled wand, bubbly micro touch-a-bubbles, Tinkerbell character sticker sheet and a pretty temporary body tattoo. A beautiful metallic organza drawstring party bag containing a magical jewelled wand, Tinkerbell and friends notebook, pencil and rubber, bubbly micro touch-a-bubbles, a fairy glider and pretty temporary body tattoo. A super cool organza drawstring party bag containing a wooden bat n ball game, a pirate telescope, a pirate sticker sheet and skull & crossbones temporary body tattoo. A super cool organza drawstring party bag containing a foam superhero face mask, build it yourself flying superhero kit, a superhero wall walker and a packet of micro catch a bubbles. Simply call us on 07808 884944 or click above to book your princess party bags and they will be brought along on the day of your party ready to hand out to your royal guests. * 100% Money Back Guarantee – In the unlikely event that for some reason you may not like the party bags you’ve chosen when delivered we will happily refund all monies paid for these in full. All that we ask is you notify us before we leave your party premises and provided the goods are unused and have not been altered to your specifications, we will process any refund due to you. Especially created and supplied by Special Additions Luxury Party Bags Ltd.